Jackie Patterson mixing it up. Photo by Jerry Horn. 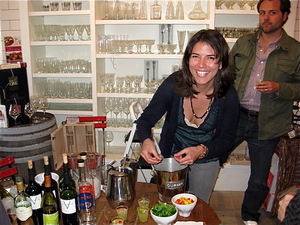 At my book signing event last week at the Tyler Florence shop in Mill Valley, faboo bartender Jackie Patterson made a most-refreshing cocktail for us. As promised to guests that evening, here’s the recipe—you’ll want to make a pitcher of it, it’s that good.